Sun Parasol Mandevilla has beautiful trumpet-shaped flowers on vining green foliage. These have much larger blooms than other varieties. They are around 4-6 inches in diameter. 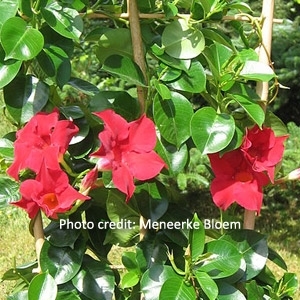 Mandevilla climbs quickly up a trellis and blooms all summer long. Aggressive evergreen vine, dark green foliage. Excellent choice for arbors or groundcover. 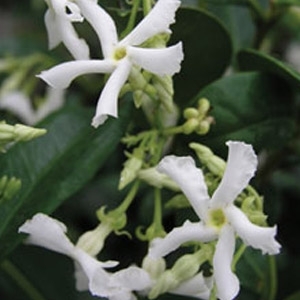 In early spring and summer, Confederate jasmine produces clusters of small, white flowers that look like tiny pinwheels. Despite their diminutive size, the flowers pack a huge punch of sweet fragrance and can easily perfume an entire yard.